But what a wonderful bounty this week! A variety of root veggies plus a variety of greens makes for endless meal ideas. 2) Last sign up for winter share is at last pickup. The first 12 people to sign up receive a free almond butter! Application is attached, or find it on the CSA facebook page or website. 3) The Lewis Waite Thanksgiving turkey order deadline is Friday morning, November 10 for delivery at the final pickup, November 16.For ordering information go to their website www.csalewiswaitefarm.com. 4) If you want to serve Elisabeth’s tortes at your Thanksgiving table, she is taking pre-orders and you may pick them up at last pickup, November 16th. The fruit tortes are 8″ for $25 or 4″ for $6. Email Elisabeth @sweetwilliamstorteshoppe@gmail.com or txt/call (646)483-8046. 4) Composting update. You can still do your composting at Queens Botanical Garden all year round (open all garden hours). The http://queensbotanical.org/ is located at 43-50 Main Street, Flushing. If you already registered, check your email for a quick 3 question quiz to get the bin combination. If you haven’t registered, but would like to participate simply fill out this Google Form and stay tuned for an email or phone. Thank you, and happy composting! Reminder: especially now, as it getting cold and dark earlier – if you can’t make it to pick up please contact us! We monitor the phone and email during pick-up. We are happy to try to work out an alternative for you, or you can just donate, but please let us know. Everyone is a volunteer and would like to get home. A big shout out to Jill Abbott! If you are able to give more than your minimum 4 hours, please do! We still have a slot open for tomorrow, November 9. Fruit shares: Fruit shares will continue for those that get them. One bag of apples per share. Lewis Waite delivery this week and next week (for turkeys). No on site vendor this week. We have more Queens Hot Sauce for sale! This hot sauce is 100% sourced with local peppers from various locations in Queens, including John Bowne High School. The CSA is selling it for $6 a bottle. Cash preferred. Edible Queens is hosting a Meet & Greet on Tuesday, Nov 14 at 6:30pm at Lockwood Jackson Heights. Meet the editorial staff and receive 15% off anything in the shop. Check out our (or Just Food’s) Facebook for more cool upcoming JF events or any local events. And please, let us know if you have a food related local event coming up you’d like us to mention! If you don’t follow us on social media, please do. 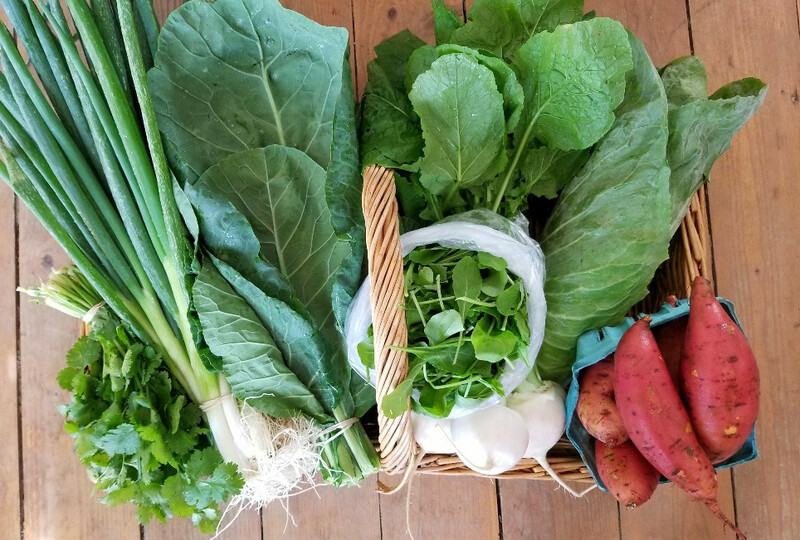 But more importantly, if you are on social media and posting about your share, please help some hashtag campaigns we support: #ShareYourShare and #JustDelivered are a Just food initiative to spread the word about CSAs in NYC. And #MyFlushing is a grassroots effort to highlight the awesomeness, vibrancy, and diversity of Flushing. Storage: In an airtight (plastic) bag in the refrigerator.Uses: Raw/Cooked When to use: Within 5 days. Storage: In an airtight (plastic) bag in the refrigerator.Uses: Raw/Cooked. When to use: Within a week. Storage: In an airtight (plastic) bag in the refrigerator.Uses: Raw/Cooked. When to use: Within 5 days. Previous Flushing CSA (Week 23)! Next Flushing CSA (Week 25)!